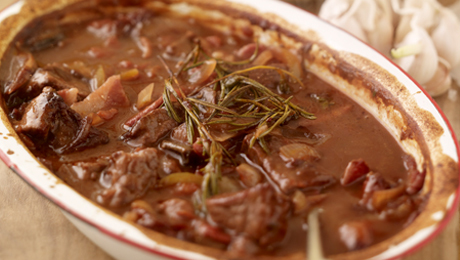 A lovely beef dish - perfect for a romantic night in! Place the steak, garlic, onion, celery, herbs and wine into a large glass bowl and cover, place in the fridge preferably overnight but at least for 4 hours. Place the marinated beef and vegetables into an ovenproof dish and pour over the tomatoes, season with salt and pepper and cover, place in a preheated oven for 2 hours. Drizzle some olive oil into a pan and add the leek, bacon and mushrooms, cook for 4 – 5 minutes until the bacon is crisp. Remove the casserole from the oven and add the vegetables. Add some water to the cornflour to form a paste then pour into the casserole, stir to combine. Return to the oven for a further 20 minutes until thickened. Peel the potatoes and cut into large chunks. Place in a large saucepan and barely cover with water, cook for 25 minutes until very tender but not falling apart. Drain the potatoes and return to the saucepan over a low heat. Using a potato masher roughly mash the potatoes Squeeze the pulp from a few of the garlic casings, depending on personal taste, and add to the potatoes. Add butter and cream to the potatoes, beat with a wooden spoon until fluffy. Season with salt and pepper.